As many of you may know my little boy turned one last month and we welcomed an assortment of new toddler paraphernalia into our home. We didn’t buy him too much and most people asked me what to get so we received some useful gifts. We tried to get him toys that are going to last a few years now; the Mega Blocks table has a permanent spot in our living room and there is always plenty of space for books. All of these new additions can be overwhelming for a little boy and it has taken him a while to investigate and explore to see which his favourites are. As we laid the presents out the night before, me and James were taking bets as to which he would like most. Typically neither of us got it right. 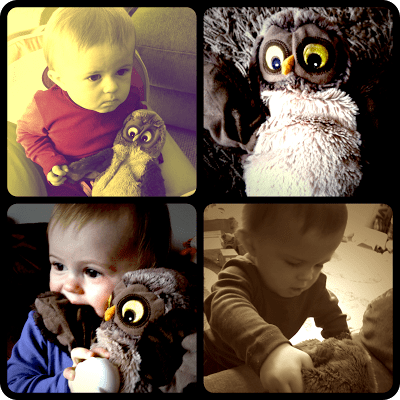 His favourite by a long way is Archie the Owl. We picked Archie up in Ikea; I was shopping with my mum and as it was near his birthday she claimed him so someone could give him as a present (I was just buying him because I thought he was cute). This was a few weeks before his birthday and I had long forgotten about Archie so when he popped up in the present from my Auntie I was thrilled he had made it back to us. Lucas took a shine to him straight away; we named him Archie after the owl in Sword in the Stone, Archimedes. He is a hand puppet so of course he is brought to me several times a day then I can bring him to life and Lucas chuckles away as Archie tickles his feet and swoops around. Lucas is around the age when he would start to find ‘favourites’ in his toys and I think Archie will be The One, The Favourite Toy. In fact I am thinking of buying a spare! Seeing him with Archie has made me think about my toys when I was young. I’m not sure what my favourite was when I was a toddler; I had A LOT of teddies! However, a certain cuddly toy by the name of Pink Puppy still has a hallowed spot on my bedside table. I remember the day I got Pink Puppy; it was my first visit to see my new brother in hospital and I was four. My Dad had picked me up and on the way we stopped so I could get a teddy to give to my brother (I can’t remember what I got for him) but I was also allowed to pick one and Pink Puppy came into my life. Other teddies came and went but Pink Puppy had a permanent spot in my bed and he came on countless holidays with us. He is a little bedraggled now and isn’t so much of a pink colour anymore but he is still there by my bed. Luckily I never lost him; not that I know of, unless my mum had a spare. I remember my brother losing his favourite, an Ed the Duck puppet, off a multi-storey car park. I wouldn’t have liked to gone through the horror of losing Pink Puppy, especially in such upsetting circumstances. So maybe Archie will become a permanent fixture in our lives, at least for a while. Only time will tell but it’s nice to think that this little owl will be around to offer comfort and maybe in years to come he can have a spot on a bedside table too.